"I am always in the picture somewhere". Bouncing between ferocity and jubilance, Denise Gale’s paintings possess a material isness that is kinetic yet resolute; fixed but explosive. In her work, layers of paint variously slather, splatter, drip, and streak across the canvas surface, coming to rest within compositions that at once beg for mercy and at the same time tap the latent romanticism that has come to define action painting. Explicit in their overall syntax, Gale’s canvasses flirt with painterly chaos, eventually wrestling it into the gaze of a besotted lover. Drunk, yet wide, wide awake. 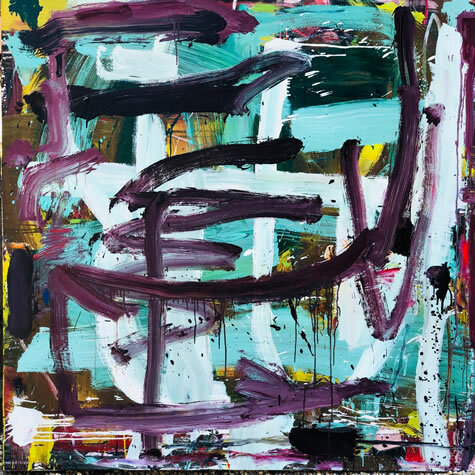 The artist Franz Kline, a scion of the New York School, spoke of painting as a “situation.” In other words, the artist creates a circumstance into which she finds herself situated. This is true of Gale, whose process involves layering the canvas like chapters in a book that culminate, over time, into a whole. Loose paint followed by structure, followed by striations and strokes and following that, a panoply of decision after decision. When she finds herself inside it, the painting is complete. In the work, Boss, she wrestles a chocolate brown grid into and atop of skeins of pale blue, cherry red, and dirty yellow. To call it a grid is a bit fanciful (it’s more like a ravaged baymen’s net), yet it fastens itself to the primordial soup within the picture plane below like a safety harness. On the right, an errant brush swirls through wet pigment as if a small cyclone has set down on its surface. A dalliance, of sorts, with roots in a type of pictorial irony that exudes humanness and a touch of slapstick. Relative to Boss, the painting, Walking and Talking, is downright lyrical. Here, strokes of violet swoon across the image field, looping over thick strokes of turquoise, terra verte, and lemon yellow. This is a gentler abstraction - its skirmish less savage - with zaftig contours that droop and slide over small syllogisms and spatters of black. Denise Gale is of-the-moment. Smart and judicious, mortal and scrappy, and, above all, a painter whose swashbuckling paintings are about…painting. Janet Goleas is an artist, critic, and independent curator living in East Hampton, NY.